All horses, regardless of their activity, experience strain affecting their musculoskeletal system and spine. Repeated strain may lead to discomfort or stiffness, and creates specific nutritional requirements. Sport horses are subject to strict doping restrictions, and certain ingredients are prohibited during competitions. The Ekyflex Nodolox Flash formula relies on a combination of plants: white willow, boswellia and quercetin, and is rounded off with omega-3. For a one-off boost, give one syringe per day for three days before the event. 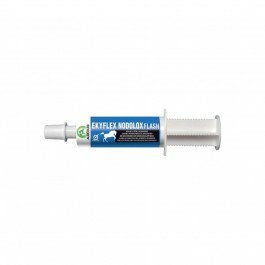 Ekyflex Nodolox Flash can also be alternated with Ekyflex Nodolox pellets. Please Note:Contains salicin. During competition, do not give more than 3 syringes per day. Product analysed for the Audevard anti-doping programme. Contains salicin. During competition, do not give more than 3 syringes per day. Product analysed for the Audevard anti-doping programme. (Salix alba), fish oil (Omega-3 fatty acids), quercetin ; Analytical constituents: Humidity 65%, crude protein 0.5%, crude cellulose 6%, crude fats 0.2%, crude ash 0.1%, sodium 0,01%. Daily allowance:1 Ekyflex Nodolox Flash a few hours before exercise.